It seems that the beginning of the last spring month was a very crucial time for the fans of Call of Duty franchise. On the 1st of May, the next part in the popular shooters’ series – Call of Duty: Advanced Warfare game - was revealed together with the announcement trailer and plenty of exciting details. Call of Duty: Advanced Warfare game will be the first part in the new sub-series, the events of which start in 2052. Although the plot takes place in rather far future, the problems of the futuristic world are the same. As always, you will be involved in a cruel war with lots of hot battles, desperate operations and powerful enemies. However, this time the protagonist will wear the fantastic suit and will get the immense arsenal of the futuristic weapons. Together with the announcement, the developers have already revealed the first trailer of Call of Duty: Advanced Warfare game. In this video, we meet the antagonist of the upcoming shooter – some bad guy who wants to become the new world’s leader. And as you can see, Kevin Spacey – famous American actor – plays the role of the most powerful enemy in Call of Duty: Advanced Warfare game. And the second thing that can’t be left without attention is the breath-taking graphics of the upcoming shooter. 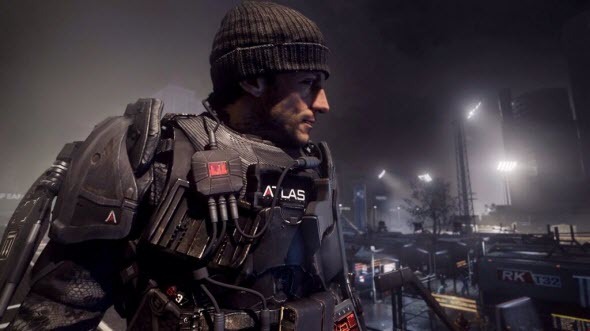 Beautiful landscapes, greatly designed details and awesome faces of the revealed characters hint that Call of Duty: Advanced Warfare game will be a real next-gen shooter. The game has been being developed for already three years, and the developers are planning to finish it until the 4th of November. Sledgehammer Games studio is working on Call of Duty: Advanced Warfare game for Xbox One, PS4 and PC, while another one company, which hasn’t been announced yet, is in charge of the PS3 and Xbox 360 versions. The footage that was shown in the trailer is from the next-gen Call of Duty – the version for Xbox One. Has the Call of Duty: Advanced Warfare game impressed you? Are you waiting for its release date? Your answers can be left in the comments below. And if you are in a hurry to get the new shooter, then you can pre-order it already now. Moreover, Gamestop offers Call of Duty: Advanced Warfare game for $59.99 with an additional Personalization Pack.